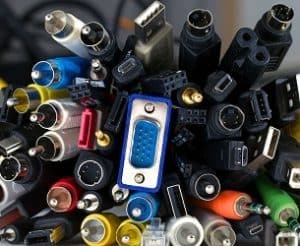 Partner with a Cable Assembly Manufacturer to increase your product’s efficiency and functionality with specialized colors, connectors, and more. As any manufacturer can attest to, the more components a product has, the higher the risk of installation errors, added complexity for customers, and increased production times. A product with a complex wiring system is not exempt from this and can have detrimental, and potentially dangerous results if the wiring is not properly installed. Custom-made wiring and cable can be designed to match almost any existing product or desired look. This is helpful for stylized products or when masking cords and cables so that they are less visible. Manufacturing techniques have evolved so that these products can be made in almost any color and can be produced in a variety of finishes to match your final product. Aside from altering a product’s appearance, customizing the color of your wire can also serve as an important safety feature. Color-coding cables and wires can greatly reduce the chances of a wiring element being incorrectly installed. Visibly labeling the wires this way can streamline the installation process to make production faster, easier, and more accurate. Production times can be decreased by giving those installing these wiring systems just one wire harness or cable assembly to work with. This reduces the need to track down other products and individual wires. When possible, combining multiple wires to form one cable is also beneficial and can reduce the number of connections that must be made during the manufacturing process. The risk of production errors can be decreased by using wire harnesses and cable assemblies. These products are beneficial because they ensure that the proper wires are being used and that none are duplicated or left out. This not only streamlines installation but also makes troubleshooting a faster process as all of the wiring components are neatly housed together. Cable assemblies can benefit products that require customer assembly. Opening a new product and finding a tangled heap of cords and wires is overwhelming for consumers and can urge many to make a call to customer service or struggle to ensure that they are wiring their new product properly. This frustration can be eliminated by using a well-labeled wire harness. Handling just one wiring system instead of several small wires is easier and reduces much of the headache that results from having to untangle a heap of cords. This will help customers to discern the product’s layout and where the specific connectors belong, in some cases reducing the number of individual connections by consolidating several wires into one cord. Simplifying the installation process leads to happy customers and has the ability to reduce customer service call volumes. Working with a manufacturer to create specific, user-friendly wiring systems is a great way to simplify your product’s manufacturing and installation process. By reducing the chances of errors during installation, your product’s safety and reliability can be improved drastically. This manufacturing method also has the potential to speed up production by making cords easier to identify, sort, and store. Learn about the most common types of wire jacketing, the benefits of each, and which will be ideal for your product. There are so many options when Choosing Cable Assembly Jacketing Material that finding jacketing materials for your custom cable assemblies, wires, and cables can be an exhasutive and daunting task. If you don’t know the jacketing material is what covers the conductor and insulation used in your custom wiring project. This outer covering will be used to protect your wiring from moisture, chemicals, UV rays, temperature extremes, or any other harsh conditions that your assembly may encounter. For this product to be as effective as possible, it’s crucial that you discuss the product’s specifics and environment with your manufacturer and their engineers before settling on a final product. 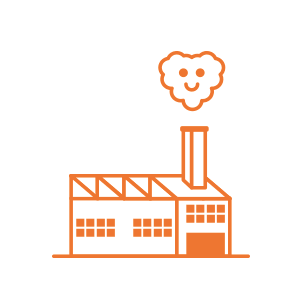 Because of the specific nature of this product, it’s important to work with a designer who is willing to manufacture prototypes of your product to ensure that everything will run smoothly when you begin manufacturing on a large scale. Finding a cable extruder who is willing to make small cable runs is critical to help control development costs. 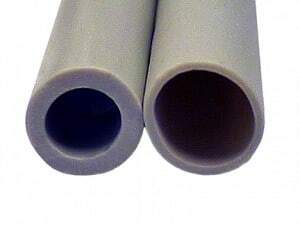 Polyvinyl chloride, or PVC as most of us know it by, is often used because of its low cost and adequate durability for many uses. This makes it great for cords that need to withstand the wear and tear that comes with average users and moderate daily use. This type of jacketing can also be formulated to resist UV rays, making it a possible jacketing material for cable assemblies that will be housed outside. A downside of this material is that while it can withstand temperatures ranging from -20°C to 105°C, it is not ideal for situations that require high heat or extreme wear. This type of jacketing works best in environments where the cable is not exposed to extreme conditions. Thermoplastic Elastomer, or TPE, can handle a broader range of temperatures than PVC can. This makes it the preferable choice of jacketing for a wider range of temperature extremes than PVC. Its ability to withstand temperatures ranging from -50°C to 105°C make it perfect for projects that need to withstand a variety of temperatures without becoming brittle or cracking. It also has a high modulus of elasticity, making it a great choice where high flexibility is needed or wear may occur – it thus makes a wonderful coil cord. This type of material is typically easier to produce than natural rubber as it requires fewer steps to process. This can reduce the time it takes to produce, speeding up the manufacturing process. 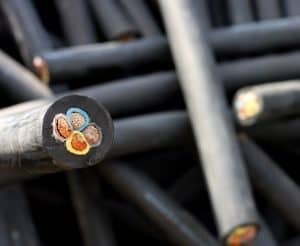 This material can have a high shrink rate and surface friction though, so it is important that the cable is designed properly to ensure that these properties do not adversely affect the final product. To avoid this, it’s important that your cable manufacturer produces prototypes first to ensure that the final cured product will be the correct size. Polytetrafluoroethylene, or PTFE, is often referred to as Teflon® as a registered trademark of Chemours. This material can handle extreme temperatures, as low as -200⁰C to 260⁰C. It also has excellent flexibility, abrasion resistance, and chemical resistance. 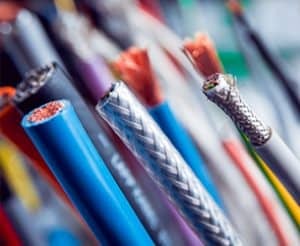 Because of these properties, and because it has the highest cost of the materials listed here, PTFE is best used when the cable will experience very extreme conditions. 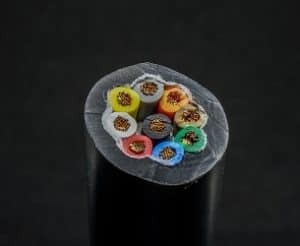 These are just a few of the jacketing materials that your custom cable assembly manufacturer may choose to utilize based on the customer’s needs, the manufacturer’s cable experience, and the industries that they typically operate in. All of the materials covered in today’s post are thermoplastics, if these materials don’t seem like they would be able to meet your product’s needs, it’s important to understand that there is an abundance of additional jacketing options that might be more effective for your product. Need help when Choosing Cable Assembly Jacketing Material for your next project? Our engineers and designers have years of experience with cabling and manufacturing products in a variety of industries, ranging from the medical industry to telecommunications, and are happy to help!